From tiny beads to large sculptures, and from ordinary bottles to sophisticated lenses and optical fibers, the multiple uses of glass have transformed our world. The word glass may be defined as an amorphous solid that is usually produced by mixing silica with other chemicals at high heat, and allowing the mixture to cool without forming a crystalline structure. It is commonly a transparent, hardwearing, chemically inert, and biologically inactive material, with smooth, impervious surfaces. It is, however, brittle and can break into sharp shards. Glass-making technologies have developed over many centuries, and the properties of glass can be modified significantly with the addition of various compounds, heat treatment, and other techniques. Today, glass continues to be used extensively for both artistic expression and practical applications ranging from micro-pipettes in the microbiology laboratory to cookware in the home kitchen and from automobile windshields to lenses for telescopes. 3.1 Is glass a liquid? Glass has been considered a valuable material since early in human history. During the Stone Age, flint knappers used obsidian, a naturally occurring glass, to make extremely sharp knives. In addition, in early civilizations, small pieces of colored glass often rivaled precious gems as jewelry items. With the passage of time, it was discovered that if glass is heated until it becomes semi-liquid, it could be shaped and left to cool in a new, solid, independently standing shape. Instructions to make glass were first documented in Egypt around 1500 B.C.E., when glass was used as a glaze for ceramic items before they were fired. In the first century B.C.E., the technique of blowing glass was developed, and what had once been an extremely rare and valuable item became much more common. At the time of the Roman Empire, many forms of glass were created, usually for vases and bottles. The glass was made from sand, plant ash, and lime (calcium oxide). The color of "natural glass" usually varies between green and bluish green, based on the differing amounts of naturally occurring "impurities" of iron in the sand. Even today, common glass usually has a slight green or blue tint, arising from the same types of impurities. By contrast, obsidian, which is produced from volcanic magma, contains impurities that give it a black color. Glassmakers learned to make colored glass by adding metallic compounds and mineral oxides to produce brilliant hues of red, green, and blue—the colors of gemstones (see Ingredients for colors below). When gem-cutters learned to cut glass, they found that clear glass was an excellent refractor of light, causing the glass to sparkle. Consequently, the popularity of cut clear glass soared, while that of colored glass diminished. Glass objects from the seventh and eighth centuries have been found on the island of Torcello near Venice. These items form an important link between the Roman era and the later period, when that city gained importance in the production of the material. About 1000 C.E., an important technical breakthrough was made in Northern Europe, when soda glass (containing sodium carbonate) was replaced by glass made from a much more readily available material: potash (potassium carbonate), obtained from wood ashes. From this point on, northern glass differed significantly from that produced in the Mediterranean area, where soda remained in common use. The eleventh century saw the emergence, in Germany, of a new approach to making sheet glass. The process involved blowing the glass into spheres, swinging them out to form cylinders, cutting them while still hot, and then flattening the sheets. This technique was perfected in thirteenth-century Venice. From the fourteenth century onward, the center for glass making was Venice, where many new techniques were developed. Venice became the hub of a lucrative export trade in dinnerware, mirrors, and other luxury items. Eventually, some of the Venetian glassworkers moved to other parts of northern Europe, and glass making spread with them. Around 1688, a process for casting glass was developed, and the material became much more commonly used. The glass-pressing machine was invented in 1827, allowing the mass production of inexpensive glass articles. Artistic patterns are sometimes etched into glass using an acid or other caustic substance (which "eats" into the glass). Traditionally, this was done by a trained artisan after the glass was blown or cast. In the 1920s, a new mold-etch process was invented, by which an image was etched directly into the mold, so that each cast piece emerged from the mold with the image already on the surface of the glass. This technique reduced manufacturing costs and, combined with a wider use of colored glass, led to cheap, popular glassware in the 1930s, later known as "Depression glass." Prior to the twentieth century, various methods of making hand-blown glass were developed. Some of the different types of glass produced by these processes were known as crown glass, broad sheet, cylinder blown sheet, blown plate, and polished plate. The process for making crown glass was first perfected by French glassmakers in the 1320s, notably around Rouen. 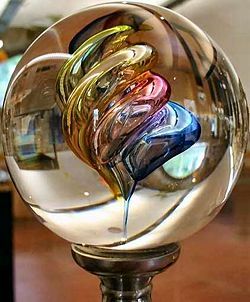 In this process, glass was blown into a "crown" or hollow globe, which was then reheated and spun out into a flat disk, up to 5–6 feet (1.5–1.8 meters) in diameter. Because of the manufacturing process, the best and thinnest glass would lie in a band at the edge of the disk, while the glass became thicker and more distorted toward the center. To fill large window spaces, many small diamond-shaped pieces would be cut from the edge of the disk, mounted into a lead latticework, and fitted in the window. The process was kept a careful trade secret for centuries. As a result, crown glass was not made in London until 1678. Broad sheet glass was made by blowing molten glass into an elongated balloon shape with a blowpipe. Then, while the glass was still hot, the ends were cut off and the resulting cylinder was split with shears and flattened on an iron plate. The quality of broad sheet glass was not good, with many imperfections. Cylinder blown sheet was created using a similar process, but a larger cylinder was made by swinging it in a trench. The process produced much larger panes and improved surface quality over broad sheet. Blown plate was made from broad sheet glass by laboriously hand grinding and polishing both surfaces. It was of sufficient quality and size for mirrors and coach glasses. The early twentieth century marked the move away from hand-blown to machine-manufactured glass, such as machine drawn cylinder sheet, rolled plate, and float glass. Machine drawn cylinder sheet was the first mechanical method for "drawing" window glass. Cylinders of glass 40 feet (12 meters) high are drawn vertically from a circular tank. The glass is then annealed (held at a temperature at which internal stresses are relieved) and cut into 7–10 foot (2–3 meter) cylinders. The cylinders are cut lengthwise, reheated, and flattened. This process was invented in the United States in 1903. In the rolled plate process, molten glass is taken from a furnace in large iron ladles, which are carried on slings running on overhead rails. The material in the ladle is thrown on the cast-iron bed of a rolling table and rolled into a sheet by an iron roller. The sheet is roughly trimmed while hot, to remove portions spoilt by contact with the ladle, and then pushed into the open mouth of an annealing tunnel or "lehr," down which it is carried by a system of rollers. To make float glass, several raw materials—sand, limestone (calcium carbonate), soda ash (sodium carbonate), dolomite (calcium magnesium carbonate), iron oxide, and salt cake (sodium sulfate)—are mixed together and melted in a large furnace. This material is poured onto one end of a molten tin bath. The glass floats on the tin and levels out as it spreads over the bath, giving a smooth glossy face to both sides. As it travels over the tin, the glass cools, solidifies, and leaves the bath in a continuous ribbon. The glass is then annealed in a lehr. The finished product has near-perfect parallel surfaces. This process produces about 90 percent of the world’s flat glass. One of the most obvious characteristics of ordinary glass is that it is transparent to visible light. 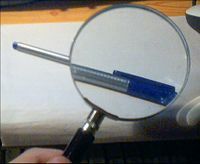 It is therefore useful for making windows and various see-through objects. By varying its composition, texture, and color, glass can be made translucent or opaque. Glass is chemically stable and unreactive, and retains its shape and structural integrity at ordinary temperatures for long periods. In addition, it can be readily cleaned with regular soaps and detergents. These properties make it a good material for containers to store food and laboratory chemicals, and to carry out chemical reactions. It is, however, brittle and shatters into many pieces when it strikes (or is struck by) a hard surface. Various techniques have therefore been devised to strengthen glass (see Specialty glasses below). The main constituent of glass is silica (SiO2). Pure silica glass (also called fused quartz) does not absorb ultraviolet (UV) light and is used for applications that require transparency in this region. Ordinary glass, on the other hand, absorbs (and blocks) UV radiation. It partially blocks UVA light (wavelengths between 380 and 315 nanometers), and it totally blocks UVB (315–280 nm) and UVC (below 280 nm) radiation. This property of ordinary glass is due to the presence of compounds such as soda ash (see Ingredients in glass below). The stability of glass also means that it does not break down in the environment. Discarded glassware needs to be properly recycled in order to avoid the buildup of trash. One common misconception is that glass is a "super-cooled liquid of practically infinite viscosity" when at room temperature. Supporting evidence often cited is that many old windows appear thicker at the bottom than at the top. It is assumed that the glass was once uniform and, over time, flowed to its new shape. It needs to be understood, however, that glass panes made in the past were usually not of uniform thickness, as noted above (see Hand-blown glass-making). When installed in a window frame, the glass would be placed thicker side down for the sake of stability and visual effects. Occasionally, such glass has been found thinner side down, probably as a result of carelessness at the time of installation. If medieval glass flowed perceptibly, then ancient Roman and Egyptian objects should have flowed proportionately more—but this is not observed. Also, if glass flows at a rate that allows changes to be seen with the naked eye after centuries, then changes in optical telescope mirrors should be observable (by the technique of interferometry) in a matter of days—but this, too, is not observed. In the case of refracting telescopes with large objective lenses, the lens (which is supported only around its edge) has been found to sag under its own weight. The result is a loss of focus. It occurs not because the glass flows over time but because it is not infinitely rigid. This effect, among others, limits the size of a refracting telescope. As noted by physicist Edgar Zanotto, glass at room temperature is very strongly on the solid side of the spectrum from solids to liquids. Although pure silica can be converted into glass for special applications, it has a melting point of about 2,000° C (3,600° F). The melting point is lowered to about 1,000°C (1,800° F) by adding either soda (sodium carbonate) or potash (potassium carbonate). The presence of soda, however, also makes the glass water soluble, which is usually undesirable. Therefore, lime (calcium oxide) is added to the mix, to restore insolubility. The resultant glass contains about 70 percent silica and is called soda-lime glass. This type of glass accounts for about 90 percent of manufactured glass. Besides soda and lime, other ingredients are usually added to impart a variety of properties to glass. For instance, when lead oxide is added, the resultant "lead crystal" has a much higher refractive index than normal glass, and consequently much greater sparkle. The addition of barium also increases the refractive index. If boron is added, it alters the thermal properties of glass, making it more resistant to breakage during rapid changes in temperature. This is a feature of Pyrex glass, a brand name for borosilicate glass. Thorium oxide was formerly used in producing high-quality lenses, but it is radioactive and has been replaced by lanthanum oxide. Large amounts of iron are used in glass that absorbs infrared energy, such as for heat-absorbing filters in movie projectors. Cerium(IV) oxide can be used for glass that absorbs ultraviolet (UV) radiation, which damages DNA and living tissue. Additional ingredients may be added to produce glass in a wide range of colors (see below). Scientists can now make glass vessels in which biologically active molecules, such as enzymes, are embedded. These vessels can then be used to carry out reactions catalyzed by the enzymes. Preparation of this type of glass, however, cannot be carried out by the usual, high-temperature methods, because the heat would destroy the enzymes. Instead, it is prepared by an innovative approach that falls in the category known as polymerization. One example of this approach is called the sol-gel process. Metallic additives in the glass mix can produce a variety of colors. Here cobalt has been added to produce a bluish colored decorative glass. The inside of a blue glass cup. Glass with a wide range of colors can be produced by adding different metals and metal oxides during the manufacturing process. For instance, when manganese is added in small amounts, it removes the green tint lent by iron; and at higher concentrations, it produces an amethyst color. Selenium, likewise, can be used at low concentrations to decolorize glass, but at higher concentrations, it imparts a reddish color. At low concentrations (0.025–0.1 percent), cobalt yields blue glass. The oxides of tin, antimony, and arsenic produce an opaque white glass, first used in Venice to produce an imitation porcelain. Copper oxide, at a concentration of 2–3 percent, produces a turquoise color. Metallic gold at low concentrations (around 0.001 percent) produces a rich, ruby-colored glass, and at lower concentrations it produces a less intense red, often marketed as "cranberry." Pure, metallic copper produces a dark red, opaque glass, and it is sometimes used as a substitute for gold in the production of ruby-colored glass. Nickel, depending on its concentration, produces blue, violet, or even black glass. Adding titanium produces yellowish-brown glass. Uranium (0.1–2 percent) can be added to give glass a fluorescent yellow or green color. Uranium glass is typically not radioactive enough to be dangerous, but if ground into a powder (such as by scraping with sandpaper) and inhaled, it can be carcinogenic. Silver compounds (notably silver nitrate) can produce a range of colors, from orange-red to yellow. The way the glass is heated and cooled can significantly affect the colors produced by these compounds, but the chemistry involved is complex and not well understood. New shades of colored glass are frequently discovered. Glass is an extremely useful material, serving both practical and artistic needs. Many objects in homes and offices are made of glass. Drinking glasses, bowls, and bottles are often made of glass, as are light bulbs and mirrors. The picture tubes of computer monitors and televisions are also made from this material. Retail stores use glass cases to display as well as protect their products for sale. Scientific research laboratories are equipped with flasks, test tubes, beakers, thermometers, measuring devices, and other pieces of apparatus made from glass. For these applications, borosilicate glass (such as Pyrex) is usually used for its strength and resistance to thermal shock. Most large laboratories need so much custom glassware that they keep a glassblower on staff. Glass is also valuable for making lenses, with surfaces that are convex, concave, planar, or a combination of these types. Depending on its shape, a lens can concentrate or diverge light. Lenses are useful for such things as magnifying glasses, eyeglasses, cameras, microscopes, binoculars, and telescopes. For certain applications, quartz glass (made of pure silica) is used, although it is more difficult to produce. Pure silica glass is also used to make fiber optic cables that can transmit light over long distances and are therefore useful for the telecommunications industry. Undersea cables have sections doped with erbium, which amplify transmitted signals by laser emission from within the glass itself. Glass has been used in buildings since the eleventh century. It is typically used as a transparent material for windows and other architectural features. It may also be used for internal, glazed partitions. Glass in buildings can be of a safety type, including wired, toughened, and laminated glasses. Glass fiber insulation is common in roofs and walls. Foamed glass, made from waste glass, can be used as lightweight insulation. The artistic uses of glass are discussed under Glass art. Automobile windshield displaying a "spiderweb" cracking pattern typical of laminated safety glass. Laminated glass, invented in 1903 by French chemist Edouard Benedictus, is a type of safety glass that holds together when shattered. It is currently produced by bonding two or more layers of ordinary, annealed glass with a plastic interlayer, usually polyvinyl butyral (PVB). A typical laminated makeup would be 3 mm glass / 0.38 mm interlayer / 3 mm glass, referred to as "6.38 laminated glass." In the event of breakage, the interlayer keeps the glass layers bonded and prevent them from falling apart into sharp pieces. This produces a characteristic "spiderweb" cracking pattern when the impact is not enough to completely pierce the glass. Laminated glass is normally used when there is a possibility of human impact, or if the glass could fall if shattered. Shop front glazing and automobile windshields are typically laminated glasses. The PVB interlayer also gives the glass a much higher sound insulation rating, due to its damping effect, and blocks 99% of transmitted UV light. Multiple laminates and thicker glass increases the strength. Bulletproof glass panels, made up of thick glass (often toughened) and several interlayers, can be as thick as 50 mm. A similar glass is often used for the front windows of airliners. 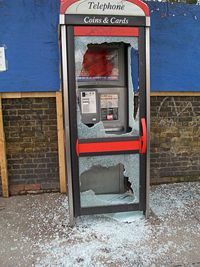 A vandalized phone booth with toughened glass. Toughened glass (or "tempered glass") is a type of safety glass that is typically four to six times the strength of annealed glass. That strength, however, comes with a penalty. Due to the balancing of stresses in the glass, any damage to the edges will cause the material to shatter into thumbnail sized pieces. For this reason, the glass must be cut to size before toughening and cannot be reworked once toughened. Polishing the edges or drilling holes in the glass is carried out before the toughening process starts. Also, ironically, the toughened glass surface is not as hard as annealed glass and is more susceptible to scratching. Toughened glass is made from annealed glass via a thermal tempering process. The glass is placed on a roller table, taking it through a furnace that heats it to above its annealing temperature (600 °C). The glass is then rapidly cooled with forced drafts of air, causing the surface to harden and contract, while the inner portion of the glass remains soft for a short time. As the inner layer contracts, it induces stresses in the surface, giving the material increased strength. Chemically strengthened glass is another type of glass with increased strength. It is prepared by immersing the glass in a potassium nitrate bath at 450º C. This causes sodium ions in the glass surface to be replaced by potassium ions from the bath solution. The potassium ions, being larger than sodium ions, "wedge" into the gaps left by the sodium ions. The glass surface goes into a state of compression, while the core is in compensating tension. As a result, the glass is strengthened. Unlike toughened glass, chemically strengthened glass has little or no bow or warp, optical distortion, or strain pattern. When broken, chemically strengthened glass still shatters in long, pointed splinters, similar to float glass. For this reason, it is not considered a safety glass and must be laminated if needed as a safety glass. 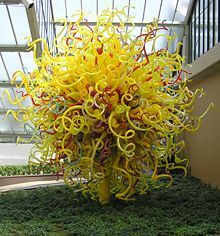 Glass sculpture by Dale Chihuly at an exhibition in Kew Gardens, London, England. The piece is 13 feet (4 meters) high. Glass art includes the creation of stained glass, working glass in a torch flame (lampworking), glass beadmaking, glass casting, glass fusing, and creating artistic shapes through glass blowing. Dating back to prehistoric times, glass art was extensively developed in Egypt and Assyria, brought to the fore by the Romans, and attained some of its greatest triumphs in the stained glass rose-windows created for European cathedrals. Decorative items made of glass include vases, bowls, chandeliers, sculptures, paperweights, beads, and marbles. Often the glass is colored during the production process, but sometimes it is painted. The term "crystal glass" (derived from rock crystal) is currently applied to high-quality, colorless glass, often containing lead, but it is occasionally used in reference to any fine, hand-blown glass. 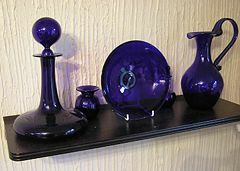 There are many techniques for creating fine glass art; each is suitable for certain kinds of objects and not for others. 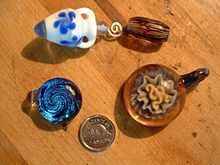 One important technique is called lampworking, in which the glass is melted with a flame and reshaped. In earlier years, lampworkers used oil-fueled lamps, but the modern practice is to use a torch fueled with propane or natural gas. Another technique is to manipulate glass in a kiln. Traditional stained glass work is commonly called cold glasswork. Glass can also be cut with a diamond saw and polished to give gleaming facets. Some famous artists in glass include Lino Tagliapietra, Rene Lalique, Dale Chihuly, and Louis Comfort Tiffany. Important contemporary artists who have produced painted glass objects include Judith Schaechter and Walter Lieberman. Well-known lampworkers include Roger Parramore and Bandhu Scott Dunham. The Harvard Museum of Natural History has a collection of extremely detailed models of flowers lampworked by Leopold Blaschka and his son Rudolph . Great ateliers like Tiffany, Lalique, Daum, Galle, the Corning schools in upper New York State, and Stubbe glassworks have taken glass art to its highest levels. In addition, Murano, a small group of islands north of Venice, has been home to master glassmakers for many centuries. 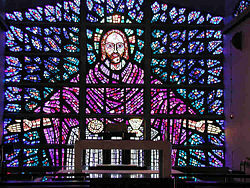 Stained glass is an art form with a long history. Many churches have beautiful stained-glass windows. The term stained glass generally refers to glass that has been colored by adding metallic salts during its manufacture. For example, copper can be used to produce green or blue glass. The molten glass is then annealed in a furnace to produce sheets of colored glass. Early artists working with stained glass were limited to a few primary colors, but today almost any color can be produced. If fine details such as shadows or outlines are required, the artist paints them on the cold glass with special paint made from metal oxides. The piece is then fired in a kiln, causing the oxides to fuse permanently with the glass. Stained glass is now available in a variety of textures that alter the color transmission characteristics of the glass and produce surprising effects. The process of making stained-glass windows involves cutting colored glass into different shapes, assembling the pieces (using lead came strips or copper foil), soldering them together, and installing them in a frame. This process requires artistic skill to conceive of the design and engineering skill to assemble the structure so that it can support its own weight and (for a window) survive the elements. Begun in Eastern Asia and among Muslim designers, the art of stained glass reached its height in the Middle Ages, particularly 1150-1250. As the solid Romanesque wall was eliminated, the use of glass dramatically expanded. Integrated with the lofty verticals of Gothic cathedrals, large windows afforded greater illumination that was regarded as symbolic of divine grace. In the nineteenth century, Romanticism and the Gothic revival caused renewed interest in stained glass. Important contributions to the art were made by William Morris (English, 1834-1898), Edward Burne-Jones (English, 1833-1898), John La Farge (American, 1835-1910) and Louis Comfort Tiffany (American, 1848-1933). After centuries of repetition and little innovation, stained glass underwent a major renaissance of form. The impetus for this new modern glass was the restoration of thousands of church windows throughout Europe, destroyed by World War II. German artists led the way, as Ervin Bossanyi, Ludwig Schaffrath, Johannes Shreiter, and many others transformed an ancient art form into a contemporary one. Corning Museum of Glass, especially Research, Teach, and Learn section. This page was last modified on 23 June 2017, at 16:07.